Imaged by David Cartier (photography) on 20th February above the Tetlin Hills of Eastern Alaska. When light from hills or other distant objects is refracted between layers of very cold dense air overlaid by warmer air it forms a 'superior mirage'. Superior because the image is above the real object. 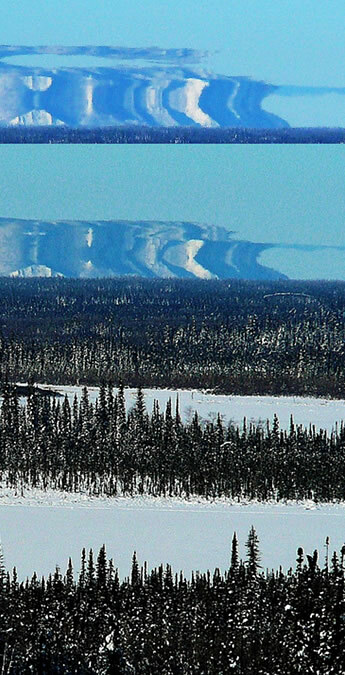 Images can be strongly stretched vertically forming apparent cliffs or fantastical towers - this is a 'Fata Morgana' named after King Aurthur's enchantress half sister. As here, the mirage changes not only with time but with your own height relative to the air layers. Mirages at sunset produce incredible sun shapes and their vertical magnification is essential to form green flashes. Image ©David Cartier, shown with permission.